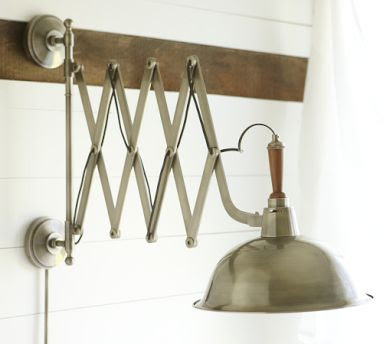 Still on the lookout for bedside lighting and came across Pottery Barn's Bristol Accordian Sconce ($180-$280). PB's fake new pricey versions of 'neat old stuff that should be attainable at a flea market for a dime' usually annoys me, but this was just too cool to dislike. I bet my Dad has something like this out in the garage to illuminate an oil change. Dad, get out there and find it. I am wondering if you could fashion one from an accordion mirror, hanging light fixture and vintage shade? I am racking my brains trying to think where I saw one of the mirrors on sale for under $20. I know I'm really late in getting to you. But you can get an accordion mirror at ikea for only $4.99. I love it! So modern and so industrial looking. It would look great in any color room... black, white, yellow. And yes, our father's probably have something just like this. Something they picked up at an Ace or the local hardware store. So funny! I do tend to get annoyed at new stuff that's made to look old and worn...either go find the authentically old version (for a fraction of the price!) or buy something new that isn't trying to fake it. But this light IS rather cool. I love the idea of sconces on either side of the bed (not that I have them but a girl can wish...) and these are a great blend of industrial and traditional. i hear you. i really dislike the detailing at the wall connection, though. Mmm, that is a lot of money. I like the look but am not sure I'd want to live with it for the next 20 years - which is how long my light fixtures probably need to last.